Ryanair, Europe’s No. 1 airline, today (6 Feb) reported that Q3 profits fell 8% to €95m, as average fares fell by 17% to just €33 per passenger, while traffic grew 16% to 29m customers. Q3 unit costs were cut by 12% (ex-fuel unit costs were down 6%). We continue to grow capacity, new routes and bases, at a time when other EU airlines are also adding capacity, and accordingly the price environment remains weak. We expect the uncertainty post Brexit, weaker Sterling and the switch of charter capacity from Turkey, Egypt and North Africa into Spain and Portugal, will continue to put downward pressure on pricing for the remainder of this year and FY18. As the airline offering the lowest fares in every market, our prices are falling faster than we initially planned but this is good news for customers, and our airport partners but bad news for competitors who cannot match our low prices. Our combination of lower fares, increased availability and AGB service improvements has stimulated industry record Q3 load factors (95%) as millions of new customers switch to Ryanair. In Q3 we took delivery of 10 new aircraft, opened 5 bases (Bucharest, Hamburg, Nuremberg, Prague and Vilnius) and launched 95 new routes as traffic grew 16% to 29m. In March we open two new bases in Frankfurt Main (No. 84) and Naples (No. 85). Naples is benefiting from over pricing in Rome Fiumicino airport where all major airlines will cut capacity in summer 2017. These new bases extend Ryanair’s entry into primary airports where our combination of lower fares and AGB customer service continues to win market share. We are growing strongly in Germany at a time when Air Berlin are restructuring. However we call on the German Government to follow London’s lead and break up the Berlin Airport monopoly which plans to close Tegel Airport so it can restrict capacity and increase prices, while leaving the city of Berlin with less airport capacity than Dublin. Ryanair has also lodged a complaint with the German Cartel Office (the “Bundeskartellamt”) which demonstrates how the proposed Lufthansa/Air Berlin wet lease agreement is nothing more than an old fashioned attempt at duopoly to share the market, block competition, and increase air fares. In Q3 we concluded a new growth deal with London Stansted which will see Ryanair grow to more than 20m passengers next year, with 9 new routes, including Copenhagen, Naples and Nice and increased capacity on 11 existing routes. 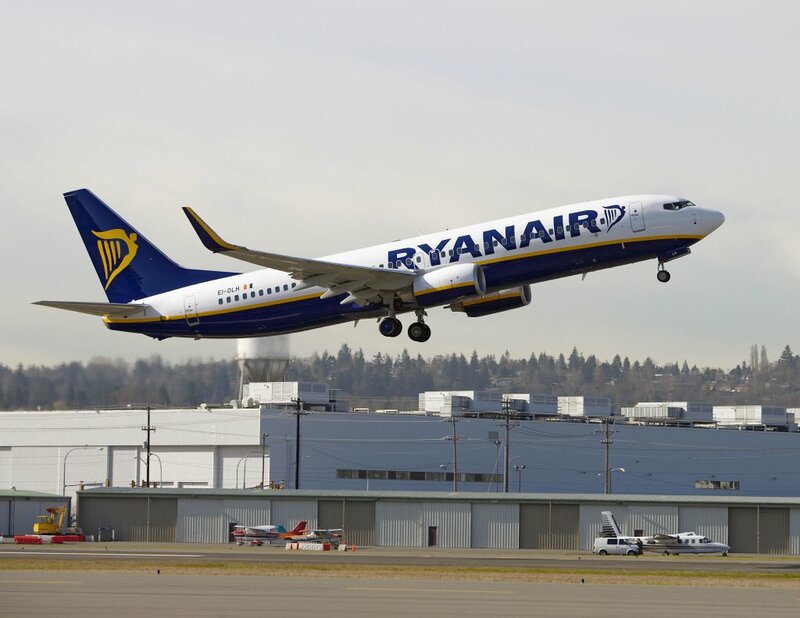 Ryanair expects to announce some additional UK and EU growth deals in the coming months as airports compete for our growth against the difficult backdrop of Brexit uncertainty. We expect to continue to grow strongly in continental Europe in 2017 with more new bases and routes still to be added. Ryanair’s low cost base is a key differentiator with all other EU airlines. Not only have we the lowest passenger costs, but these costs are falling when many other low fare competitors are forecasting flat or rising costs. As this cost gap widens, Ryanair will continue to pass on even lower fares to our customers to ensure we grow safely and profitably. Fuel costs fell by 20% per passenger in Q3. Non-fuel unit costs were down 6% as we took delivery of new B737-800s (hedged at a blended €/$ rate of $1.31), negotiated further airport growth incentives, grew load factors, and benefited from Sterling weakness on some parts of our cost base. As we grow we are continuing to target cost savings and new deals for engine maintenance, reservation systems, and the low cost in-house development of Ryanair Labs will continue to deliver material savings over the coming years as we grow to 200m customers p.a. Q4 fuel is 95% hedged at approx. $56bbl. We’ve also hedged over 85% of our FY18 fuel at an ave price of $49bbl which (allowing for volume growth) will deliver fuel savings of approx. €65m in FY18. Our AGB programme, coupled with our lower fares, continues to attract millions of new passengers to Ryanair. In Oct we launched Ryanair Rooms initially with 2 suppliers (this will rise to 5 by March 2017). In Nov we ran 8 days of low fare promotions during cyber week which delivered record bookings. In Dec we launched Ryanair Holidays, a low cost package holiday service available initially in Germany, the UK and Ireland. This holiday service will be rolled out to other markets later in 2017. Membership of “MyRyanair” became mandatory in Q3 and will see memberships surge to 20m individual customers by year end. We believe that “MyRyanair” will enable us to better design exclusive benefits for our customers, while helping to eliminate unlicenced, mis-selling OTA’s and screen scrapers. While our punctuality remains industry leading, we have struggled this winter with particularly adverse weather, repeated ATC strikes, and ATC staffing related slot delays which saw punctuality fall from 90% last year to 88% in the first nine months of FY17. We are looking at new initiatives to address this problem, including a review of our service policies such as the 2 free carry-on bags which are the cause of increasing boarding gate delays. In Nov our Board approved a €550m share buyback. We have now completed over 90% of this programme with approx. €500m spent and we expect to complete it by the end of Feb 2017. The value to shareholders of our buyback programme is demonstrated in this quarter during which PAT fell by 8%, but EPS fell by just 2%. Our ADR buyback programme has been inhibited by light volumes and the unavailability of block trades. The Board has agreed to put in place an authority to allow the Company to buy ADR’s on a more opportunistic basis (subject to market conditions and annual shareholder approvals) outside of regular buyback programmes. Our balance sheet remains strong. In Dec we moved into a small net debt position of €576m having spent almost €1bn on CAPEX, €800m on share buybacks and €300m on debt repayments in the current year. We plan to continue to manage our cash flow prudently and expect to have a modest net debt position at year-end. While it appears that we are heading for a “hard” Brexit, there is still significant uncertainty in relation to what exactly this will entail. This uncertainty will continue to represent a challenge for our business for the remainder of FY17 and FY18. We expect Sterling to remain volatile for some time and we may see a slowdown in economic growth in both the UK and Europe as we move closer to Brexit. While there may be opportunities to expand at certain UK airports (such as the recent extension of our growth deal at Stansted), we expect to grow at a slower pace than previously planned in the UK and will continue to switch capacity into other key markets around Europe. As previously noted, we hope that the UK remains a member of Europe’s “open skies” system. Until the final outcome is known, however, we will continue to adapt to changing circumstances in the best interest of our customers, people and shareholders. Our outlook for the remainder of FY17 is cautious. With less than 2 months of the year to go, and no Easter in March, we expect Q4 yields to decline by as much as -15%. We will carry over 119m customers in FY17, and full year ex-fuel unit costs should fall by approx. 4%. Accordingly we are maintaining our full year profit guidance in a range of €1.30bn to €1.35bn, but this guidance heavily depends on the absence of any unforeseen security events affecting close in bookings.